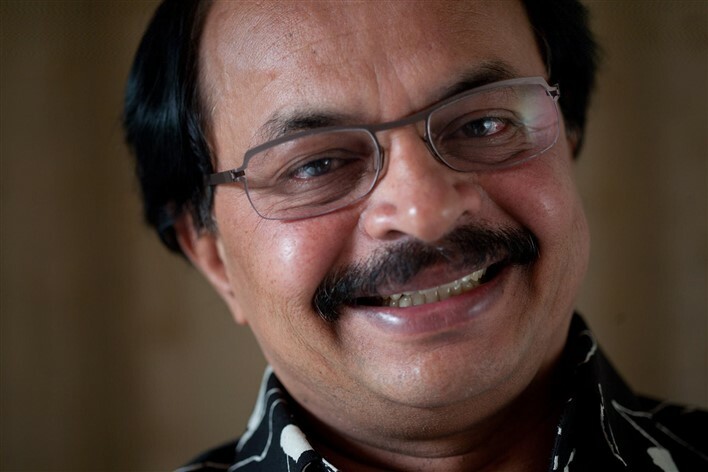 Nagathihalli Chandrashekhar is quite possibly the most famous contemporary Kannada film maker. He specialises in making movies which appeal to the youth of today, torn as they are, between their roots and a rapidly changing world. Nagathihalli is a village in the Mandya district in the hinterland of Karnataka. This district has been a stronghold of Kannada language and literature. Nagathihalli Chandrashekhar was born in a middle class family in this village on 15th August in 1951. Right from his early days, he showed a marked proficiency for language and literature and he was an outstanding student through his school and college days. He went on to do his post graduation from Mysore University and was a recipient of eight gold medals and two cash prizes. Chandrashekhar or Chandru, as he was popularly known, took up the position of Professor of Kannada at Mysore University. He was a popular intellectual and wrote stories and novels. He contributed articles of topical interest to the Kannada weekly Hi Bangalore. Chandrasekhar’s work on-campus in the academic world brought him in touch with youth, and his interactions with his students gave him the inspiration to make youth oriented movies. With his prolific literary output and increasing exposure in the world of performing arts, it was natural that Chandrasekhar received offers for scripting films. He debuted in cinema in 1988 by writing the dialogues for the 1988 film Kandina Benki. The following years found Chandrashekhar scripting and directing movies that received widespread critical acclaim. His first project as a director, Undoo Hoda Kandoo Hoda (1991), was a trendsetter in its own right. The 1996 film America America was set in Detroit and won him fans from among the Kannada speaking public overseas. Nanna Preethiya Hudugi (2001) was a teenage love story set overseas and received mixed reviews, and Amrithadhaare (2005) was a major commercial hit whose songs became very popular. The thespian of Hindi cinema, Amitabh Bachchan, gave a stellar performance in this film. Maathadu Maathadu Mallige (2007) was the first Kannada film to be screened at the Cannes Film festival. Nagathihalli Chandrasekhar’s 2010 film, Nooru Janmaku, was a love story set in a backdrop of recession and job insecurity. Being topical in nature, it was highly acclaimed among critics and fans. Nagathihalli was always known as a demanding and pushy director, and in December 2009, he courted controversy by slapping actress Aindrita Ray. The explanation given by Chandrashekhar was that he was shooting in a foreign location, Macau, and was contractually bound to finish shooting important scenes within the specified timelines. Aindrita Ray habitually partied till late hours in the night and came late to the sets, disrupting the entire shooting schedule. Aindrita refused to accept the explanation and did not report for shooting after the incident. The stalemate continued till an intervention was staged by the Karnataka Film chamber of Commerce. Nagathihalli apologised and the movie shooting resumed. Nagathihalli Chandrashekhar’s contribution in bringing in contemporary topics into cinema has been indisputable. Regardless of controversies about his attitude and behaviour, he continues to be the most popular director in Kannada cinema.